Trenton Lockhart is a 15-year-old who loves football, his family and the Pittsburgh Steelers. But unlike many other teenagers, Trenton has a form of autism that prevents him from grabbing and throwing objects like a football. 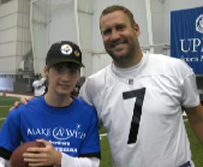 The Make-a-Wish Foundation helped Trenton enjoy the sport he loves and meet his favorite player, Ben Roethlisberger. You can watch video of Mr. Donnelly’s report here. Ben Roethlisberger has been doing some serious campaigning these days, getting in the ear of offensive coordinator Bruce Arians with his plea to run the no-huddle offense. Roethlisberger doesn’t think using it on the road is a problem and would welcome it this week against the Arizona Cardinals or at any week for that matter. You can read at Steelers.com! Jim Rome: Who and what are the Pittsburgh Steelers? Jim Rome: Why do you think the offense has been so up and down? Jim Rome: Have you ever thought about changing your style (of play)? Jim Rome: Do you ever wonder why the referees do or don’t do for you (as in not getting as many calls as other quarterbacks)? Jim Rome: Why do some quarterbacks get more calls than others (bringing up Michael Vick’s comments several weeks ago)? Jim Rome: How do you feel about being named a captain of the team this year? You can check Mr. Rome’s website later for a podcast of the interview.